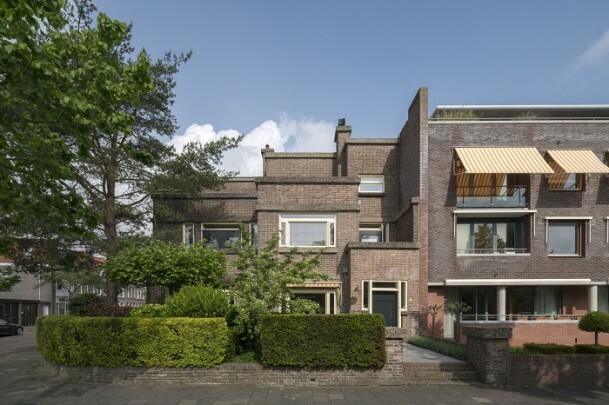 When Jan Wils and Theo van Doesburg fell out after the De Lange House, Wils turned to Vilmos Huszár for a second Alkmaar project. On the corner of Nassauplein he designed a double house for the infantry captain W. Kaas. The spatial composition of shifting volumes and horizontal bands, with the chimneys adding a vertical thrust, shows Wils in his element. It was the first time he had used flat roofs. It is not clear whether Huszár’s space-colour composition was ever executed for the hall of the house at no. 12. We do know that the living room and dining room of the corner house (no. 13) were decorated with a mural of coloured triangles.